Krishnan and I like watching movies at home .. we haven’t been to watch a movie in a theatre after April 6th, 2016 when we watched Kung Fu Panda 3 at DLF Mega Mall. In early December 2018, I saw this tweet from the most strident HMV “The Wire” and was deeply disturbed with the underlying message. How can a movie about the surgical strike against Pakistan be “toxic” and about “hyper-nationalism” ? 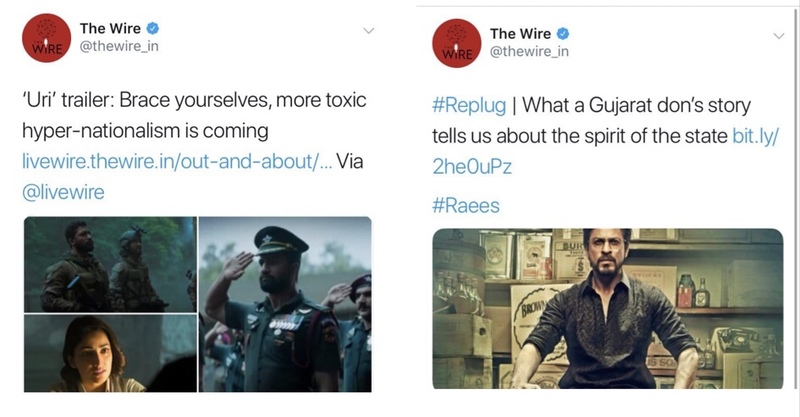 Scum who write these words are able to do so because of that soldier who stands guard at the border and a movie about that soldier’s heroics becomes “toxic” ???? And a “don” denotes the spirit of the state? How low can one get ? I wish momentarily, that we lived in a dictatorship so that people like the founders of “The Wire” can be put behind bars and the “Uber-Toxic” e-mag can be shut down permanently. BUT, we live in a democracy and our armed forces are ready to defend our nation by remaining as soldiers and not becoming heads of state. So Siddharth Varadarajan’s hide will be saved by those he calls “toxic”. I don’t know if I have the Indian soldier’s view on scum like these …. I will probably spit on his face the next time I see him. I am not physically strong enough to hurt him, and I don’t have the mentality of a “don”, so no “supari”, but I pray everyday that my country is rid of people like him. May the universal law of Karma, make him pay his debts. Yes, am hyper-emotional about the armed forces. My only regret in this life is the fact that I couldn’t don the uniform. I could have joined the support/technical/medical services, but I wanted to be part of the combat forces and that wasn’t allowed. Someday, in some way… either in this life or the next. Last week, in a first for Krishnan and I, we started the week with a movie – “Uri – the Surgical Strike” and ended the week with a movie – “The Accidental Prime Minister”. Uri – The Surgical Strike just made us feel so proud ! First of all, like my friend Sanjay wrote on FB, we love to stand up for the National Anthem at the theatre. It feels right and every time I stand up for the anthem, I think of my brothers-in-uniform on land, in air and on the seas who make it possible for me to watch a movie without worrying about a bomb going off. Since we went for the morning show, the audience was mostly young boys and girls or it was retired folk. The movie had the audience clapping spontaneously in several shots – a feeling that scum like Siddharth Varadarajan and his ilk would never know. I cried in the scene where the little girl shouts out the war cry of her dad’s regiment as he is martyred. I know that didn’t happen during the original Uri strike. This happened when Colonel M N Rai was martyred at Tral in 2015 and his daughter while saluting her father for the last time, gave the battle cry of her father’s regiment. I had cried then too. While the movie takes some creative liberties, this scene was not ill-placed. What Pakistan did in Uri was cowardly and dastardly – killing soldiers who were asleep during peacetime is unacceptable, but Pakistan’s existence itself is unacceptable !!! Loved the movie, do watch – its technically brilliant and as an Indian, your chest puffs up in pride. The Accidental Prime Minister – this movie makes one feel ashamed. Ashamed of having let things get away from us. We voted for the “FAMILY”, and if they mis-used the power, it was our responsibility to bring them down and elect someone else. The casting is just brilliant – every political leader that they have portrayed is a known face and each one of them has acted their part beautifully. Anupam Kher has essayed the role of Dr. Man Mohan Singh so well, that you only see Dr. MMS and not Anupam Kher. This is a slick production, with a tight script and really well executed. Dr. MMS was and is a good man – no one doubts that, but why did he subject himself to the agony of disrespect, subservience and powerlessness is anyone’s guess. I have a sneaky suspicion that Dr. MMS is a wily politician…. This is completely unsubstantiated but I feel, he asked Sanjaya Baru to write the book. That was his way of getting back at the “FAMILY”. I have never doubted Dr. MMS’ patriotism – he probably saved India from becoming a true banana republic in the able hands (pun intended) of the dimwit scion. Thank Karma for that. Now that same dimwit is being foisted upon us as a leader and of course there are a dozen PM wannabes in the “MahaKhotBandhan”, each one with a long list of scams behind them as qualification. Sad. Not many people would have noticed this tiny incident that happened just a week back – on Guru Gobind Singh Ji’s 352nd birth anniversary. On this day a commemorative coin was released by PM Modi at an event held in the PM’s house. Just watch this video from the 5.29 minute for a few seconds… Dr. MMS being asked by the PM to come up on stage as he released the coin. What an amazing gesture in Indian politics. Do watch both the movies and vote wisely in this year’s general election. Jai Hind. Jai Hind Ki Sena.